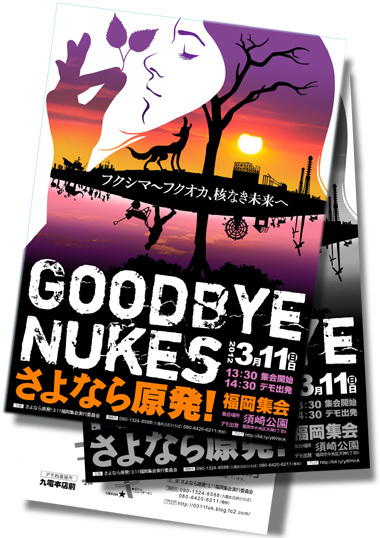 Bye to Nuclear Power Plants!! Rain or shine, the protest will be held as scheduled. 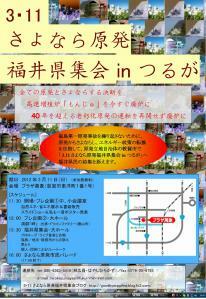 FROM KOBE TO EASTEN JAPAN!!!! FROM KOBE TO THE WORLD!!!! 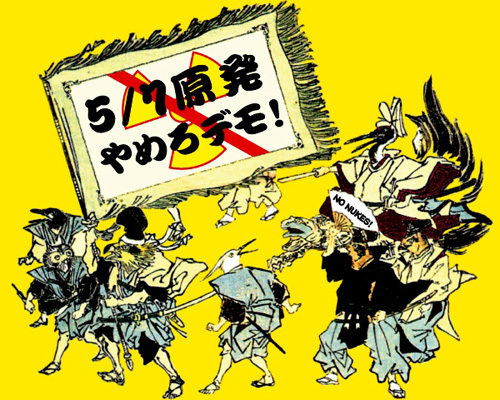 Those who organized the no nukes demonstration in Koenji, Tokyo in April are now planning to have a protest this time in Shibuya, one of the most popular spot in Tokyo. 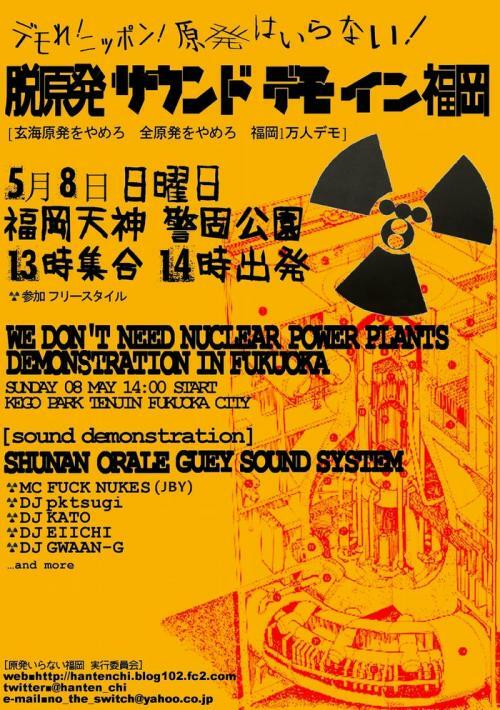 It is one month since the huge demo in Koenji, and almost two months since the great disaster struck, but the situation in Fukushima is still anything but stable! Newspapers and TV make it sound like everything is getting better, but if we stop and think about it, we realize how far this is from the truth. In fact, the situation hasn’t improved at all! If anything, radioactive matter is still leaking, the contamination is worsening and nobody even knows when this will be under control. Meanwhile, the water, land, sea, plants, animals and of course us humans are paying the price. It’s more than enough to tell us that nuclear energy is just too dangerous and scary! We must say no to any energy source that puts us in such a horrible situation. 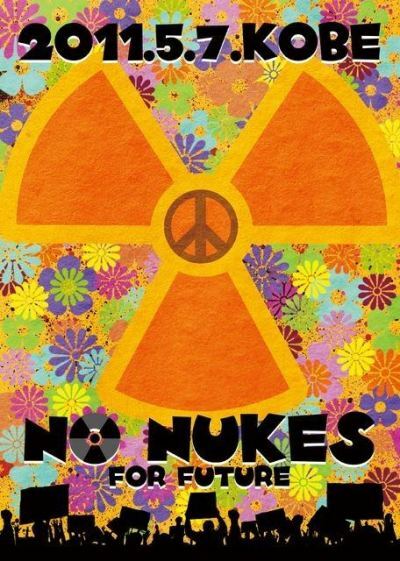 In other countries, the people have sized on this opportunity to realize the hazards of nuclear power, but Japan shows no intention to rethink their nuclear policy. We know now, more than ever, that nuclear energy was never safe or environmentally sound, and we need to get rid of it as soon as possible! Following the demo in Kouenji, we will come together once again in a giant protest against nuclear power! Last time, all kinds of people including anxious Tokyoites, mothers and fathers worried about their kids, and refugees from the areas around the power plants joined the protest. This time we will see an even greater multitude taking to the streets to voice their disapproval!! 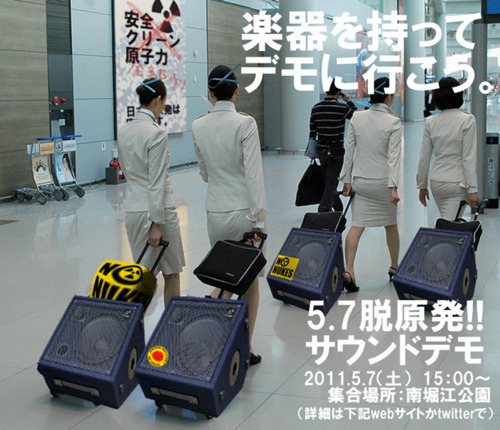 On May 7th, let’s head for Shibuya!! !